Slow Ball Cartoonist takes readers on a journey to an earlier era in America when cartoonists played a pivotal role each day in enabling major daily newspapers to touch the lives of their readers. No American cartoonist was more influential than the Chicago Tribune’s John T. McCutcheon—the plainspoken Indiana native and Purdue University graduate whose charming and delightful cartoons graced the pages of the newspaper from 1903 until his retirement in 1946. 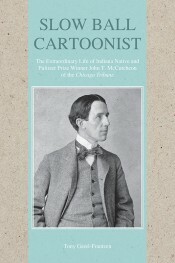 This book chronicles McCutcheon’s adventure-filled life, from his birth on a rural small farm near Lafayette in 1870, to his rise as the “Dean of American Cartoonists.” His famous cartoon, "Injun Summer", originally published in 1907, was a celebration of autumn through childlike imagination and made an annual appearance in the Tribune each fall for decades. McCutcheon was the first Tribune staff member to earn the coveted Pulitzer Prize for his poignant 1931 cartoon about a victim of bank failure at the height of the Great Depression. Born with an itch for adventure, McCutcheon served as a World War I correspondent, combat artist, occasional feature writer, portrait artist, and world traveler. Slow Ball Cartoonist is a timeless story about a humble man who made the most of his talents and lived life to the fullest, being respectful and fair to all—including the targets of his cartoonist’s pen. Tony Garel-Frantzen graduated from DePaul University in Chicago and worked as an award-winning newspaper reporter and editorial cartoonist before embarking on a long and successful career as a public relations consultant and corporate communications executive for Fortune 500 companies. During his corporate communications career, he regularly contributed his own cartoons to support communication projects. Slow Ball Cartoonist is his first book. He and his wife have three grown children and live in a northwest Chicago suburb with three dogs.